Link-Mad Monday, July 17: Community, Baby! The theme of today's link madness is community, in all its forms: neighborhood community, internet community, bookstore community, etc. As you may have noticed, this is one of my primary passions and one of the reasons I'm such a nerd about this independent bookstore thing. I think people coming together voluntarily, or being thrown together because of propinquity or common interests, or forming coalitions, or learning each others' names, or supporting each others projects, or learning from each other... well, it's just so darn cool. Yesterday I went to my first-ever political rally: the gathering sponsored by Develop Don't Destroy Brooklyn to protest the crazy development project for the Brooklyn Atlantic Yards (remember, the reason they tore down the Underberg...) The New York Times has this article about the event. For a more exciting, if much more partisan view (with pictures), here's the website of Develop Don't Destroy. The main contentions of the protesters (who included Steve Buscemi, Rosie Perez, our fiery senator Letitia James, Reverend Billy and the Stop Shopping Gospel Choir, and some actual reverends, business owners, politicians, and other citizens) are that 1) the project has gone through without sufficient community approval; 2) the planned 16 skyscrapers and gigantic arena will create enormous population density, traffic congestion, and other problems that will change the character of all the surrounding Brooklyn neighborhoods for the worse; 3) there are much better ways to achieve the "more jobs" and "affordable housing" that developer Bruce Ratner touts as the benefits of the plan. The ALP just sent me the link to this wonderful project by Anthony LaSala and Seth Kushner, The Brooklynites, a photo/essay collection of Brooklynites famous and anonymous, with their thoughts about their city. It demonstrates some of the reasons why this place is so wonderful, and so worth -- well, not preserving, because it's far from stagnant, but maintaining and developing as one place in the world with a character so powerful that change will have to come from the Brooklynites themselves, because corporate forces and homogenization just can't get a foothold. As Bogart puts it in CASABLANCA, "There are certain sections of New York, Major, that I wouldn't advise you to try to invade." Is it any wonder I want to open my store here? Go Brooklyn, and hooray for neighborhood community! The Litblog Co-Op, another fabulous conglomeration of like-minded individuals with a common goal (in this case, promoting great under-marketed books), has kicked off its summer activities. The Summer Read This! selection has been chosen: MICHAEL MARTONE by Michael Martone (published by Fiction Collective 2). It's a playful fictional autobiography, and Dan Green of The Reading Experience blog gives it an insightful preliminary review today. The following weeks will see more discussion of the book with Co-Op members -- it's like a book club with your most literary friends. I've been meaning to do a blogroll of the "leading literary weblogs" involved in the LBC for some time, so here they are, with annotation if I know anything about them. Some of these blogs are new to me, but you can bet I'll be reading them more in future, since they're now part of my community. Here, then, are the participating weblogs (it's a long list, so you can come back to it later if you want). Bookdwarf - Megan is a bookseller at the Harvard bookstore in Cambridge, and as I can vouch, a great reader and an all-around cool person. She sometimes participates in one-on-one online book conversations with Ed Champion of Return of the Reluctant. Booksquare - "News and Views for Authors"
Conversational Reading - Scott Esposito's Friday columns are some of my favorite writing about books on the web. Edward Champion's Return of the Reluctant - Edward Champion is the alter ego of Bat Segundo, who is the host of a wildly popular podcast show, and both are among the snarkiest characters in the literary blogosphere. But since he has (mostly) amazing taste, a stellar line up of books and authors, and a wickedly clever writing style, I'm inclined to cut him a bit of slack... and it's often irresistable to read what he'll skewer next. Elegant Variation - Mark Sarvas writes one of the longest-running litblogs on the web. Emerging Writers Network - Dan Wickett is a born mentor -- his blog is aimed at reaching and promoting, well, emerging writers, and he's been awfully nice to your Book Nerd as well. Literary Kicks - Levi Asher is one of my fellow new inductees to the LBC. Rake's Progress - brand new to me; based in Denver. Syntax of Things - new to me too, but Jeff (the blogger) and his wife just had a baby yesterday -- cool! The Happy Booker - Wendi Kaufman has the best blog name ever. The Millions (A Blog About Books) - You've heard my admiration for C. Max Magee, who tends to focus on internet issues and books (Amazon, Google, etc. ), with a lot of reviews and other links. The Reading Experience - the aforementioned Dan Green, who nominated the winning Read This! title for the summer. 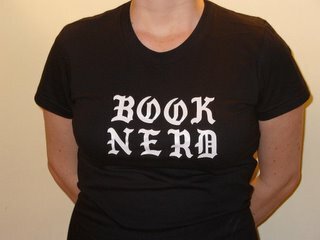 The Written Nerd - Hi, you're here! And finally, if you haven't gotten a chance to post your comments on Friday's guest blog post "My Gripe With The ABA" by bookseller Dave from New Jersey and the subsequent comments, do it now! The post sparked a fascinating conversation between Dave and Andy Laties of Rebel Bookseller fame about the potential for change within the American Booksellers Association, the benefits and drawbacks of membership, and the importance of community between booksellers. I suspect many of you have thoughts on the subject, whether you're staunch supporters of BookSense or have your own dissatisfactions, and I'd love to hear from you about any of the points Dave or Andy raise. If you're not an ABA member or would like more information, go the the ABA website and see what they offer. In the next week or so, I plan to feature another guest blogger who will make the case for the ABA and BookSense. Keep an eye out for that rebuttal, and get in the discussion now! You readers of this blog are yourselves a community, in a way, of folks interested in issues in the book industry (or just friends of mine who read out of pity, I suppose). Whether you're a bookseller, publisher, ABA board member, or book buyer, your thoughts matter, and can ultimately create change. Thank you for being one of my beloved communities. What other communities are you grateful to be part of?